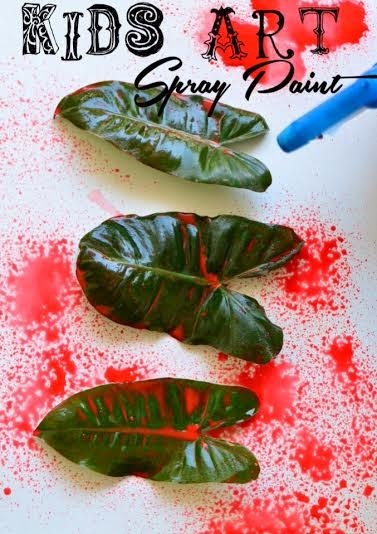 Practical Mom: Kids Art: Spray Paint..with leaves, cardboard tubes, masking tape & playdoh caps! Kids Art: Spray Paint..with leaves, cardboard tubes, masking tape & playdoh caps! 1. All activity in the balcony area, NOT inside the house. But this activity takes the cake! It's mess like you've never seen before. And as long as the 3 rules were in place, it was pretty manageable! I thought it'll be fun making silhouettes of leaves. But my 3 year old suffers from the over spraying syndrome. Sprayed and sprayed till I screamed "enough!". We tried big leaves. Small leaves. None made significant silhouettes. It was a Fail! We tried spraying on cardboard tubes. But the paint mix was too watery for any color to 'stick' on the tubes. Fail again! We tried masking tape too. But the paper got too soaked to pull the tape off. Fail again! Finally I put caps of playdoh tubbies. That worked! We finally got silhouettes! This is just a prelude to the festival of Holi that's just round the corner! It's a festival of colors, where all kids come out and spray colored paint on each other and rub dry color (abeer and gulal) on each other! This looks like so much fun! Not sure I could handle that much mess though! tempera wipes off easily! But i wouldnt reco it to anyone who doesn't want to handle the mess though! What looks like a lot of fun - and that it might just create a hell of a lot of mess...your advice on the clothes is VERY sensible! :-D Thanks so much for sharing with the Parenting Pin it Party today. yes, 'crap' clothes are the way to go ! Yes! Probably the next time my little boy will be a bit sensible abt spraying though! Some great ideas for kids play when they can go outside. What children don't like to play with water, paint etc. Thank you for sharing with the Clever Chicks Blog Hop! I hope you’ll join us again next week! Yes perfect for a hot day! Looks like he is having a great time! Thanks for linking up to Share it Saturday, I'm featuring you this week! He did. I should bring the spray bottles out again! Might have been a fail at the silhouettes, but a big win for fun! Thanks for sharing with SYC. haha, silhouettes will work only after he understands the concept! This time was too busy spraying! Exactly! He didnt care much abt silhouettes, he was busy spraying! This is a visually stunning post! I love the art even if it wasn't the outcome you hoped for, you captured a magical looking art session! Is it? Im flattered! I struggle with pictures since my kids always moving and I'm usually short of light! Thanks so much! Another great idea for kids! My 2 yr old granddaughter loves playing with water. She can sit next to a sink with running faucet for hours and play. Thanks for sharing at Thursday Favorite Things! OMG my kids STILL does that. what with kids and water?! !